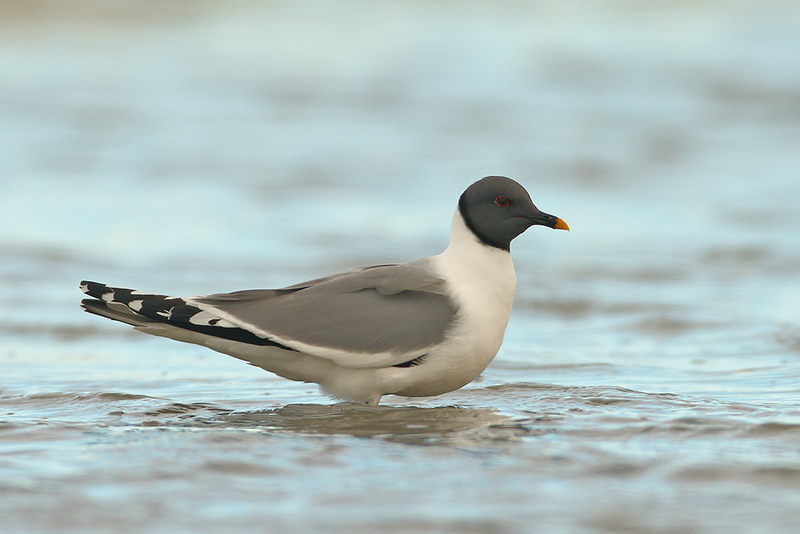 The sabine gull is fairly common in Chukotka, and surely one of the most spectacular gulls to photograph. This one was foraging in the same pond as our first spoon-billed sandpiper pair. For three weeks this past June the only thing I had to occupy my mind was bird photography. That was a very privileged feeling, and fortunately there were motives galore. In this gallery I present a number of random results from the trip, with short texts accompanying the images where needed. Remember to click on the thumbnails to get the full resolution images, and if browsing on a Windows workstation consider hitting f11 to get the full-screen experience. Slightly smaller than the spoon-billed sandpiper, and with a “normal” bill, the red-necked stint is one of 7 species of stints globally. My travel companion Jens Gregersen is one of a few global experts on identifying stints. Red-necked stints look very much like spoon-billed sandpipers except for the bill. They are much less picky about their breeding habitats, and are often found at an altitude. Also an endemic subspecies, the Chukotka variety of the red knot is less red than its Western cousins. Red knot on the breeding ground. The team finally located the nest of this pair – cause for great celebration because red knot nests are VERY hard to find. Watching them forage on ice is pretty special. This dunlin is also an endemic subspecies. It is slightly larger, and more boldly coloured, than the varieties we see here in Denmark. This wood sandpiper is about to get lucky – I have shots of him mating too, but the girl is just about completely hidden in the reeds so this shot is actually more interesting. Wood sandpipers call all over the Chukotka in June. Tattlers come in two varieties, the wandering and the grey-tailed. The two are difficult to distinguish, and to make matters worse they intermate in the Anadyr region, so you may be meeting hybrids. I believe this to be a wandering tattler, but some beg to differ. The arctic tern is present all over the palearctic. In our region they had only just arrived from their winter round-the-world trip, some two months later than they arrive in Denmark. But the games they play are the same; she waits patiently for him to find little delicacies for her, and I assume that if he does it well then she’ll mate with him. Trying to get in-flight images of the yellow wagtails. An attempt at catching the bird in flight. By far the most common bird in Chukotka is the yellow wagtail. The subspecies is endemic to the region. The ruby-throated nightingale likes to inflate the throat pouch to impress the girls. Shortly thereafter it breaks into song. Northern bluethroat singing from a favourite songpost. Having some habitat in the background makes for more interesting images. As you come closer to the nest, the peregrine falcons begin to try and chase you away. They’re fast and elegant in the air. Just hanging out on an iceberg. The glaucus gull is one of my favourites – very pretty in its breeding plumage, not least in an arctic environment like here. Temmincks stint in display flight. I like this temmincks stint with the tundra background. Pintail in full breeding attire. Common Redpoll, female right above her nest. I didn’t linger. White-fronted geese over the tundra. This image is more like a “landscape with geese! and shows the place we visited quite well, not least how it looks on the frequent days when the sun isn’t out.